Children and adults sing carols on İstiklal Avenue. Kalanda, a tradition of the Greek Orthodox community in Turkey, brought Christmas spirit to Istanbul yesterday. 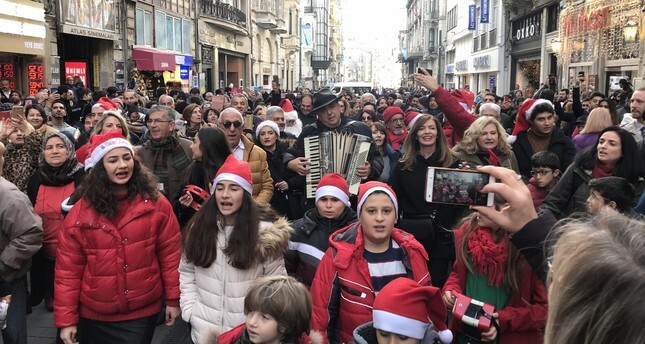 Students of Zoğrafyon Greek School, accompanied by community members donning red caps, played instruments and sang Christmas carols on İstiklal Avenue in the heart of Istanbul on Christmas Eve. The parade members also delivered Christmas gifts to onlookers and occasionally switched to Turkish songs to the delight of a curious audience. The parade ended in front of the Greek Consulate located on the avenue. Kalanda, which originally means the first day of the month, is an old Greek tradition where children go door to door singing Christmas carols. They are served snacks or other gifts by people in the houses they visit, a custom similar to Muslim festivals in Turkey where children go door to door to deliver Eid greetings, in exchange for candy. On Christmas Eve and Christmas Day, religious services are being held in churches all across Turkey, from the Church St. Anthony of Padua, Istanbul's largest Roman Catholic Church, to Fener Greek Orthodox Patriarchate in the city that serves as the leading authority of majority of Orthodox churches in the world.